For 20 years, I struggled with feeling good about myself – physically and emotionally. Five years ago I decided I needed a change. I was in a toxic work environment. I was overweight. I didn’t believe in myself. I wasn’t even sure what or who my actual “self” was. I needed and wanted to take my life back. I lost 70 pounds and found joy and energy. Life was so good and I hadn’t realized I could feel that amazing! 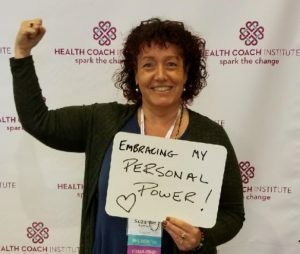 And that’s what led me to become a Health Coach… so I could share knowledge, accountability, support and use my own experiences for others to relate to. I wanted other women and men to know that feeling this good was achievable and that everyone deserves it! Then my elderly Father (99 at the time!) had some severe health challenges…so much so that I dropped everything to help him. It was my chance to do for my Dad what he had done for me and my brother as a single father for most of our lives – and I jumped at the opportunity. It meant spending most days with him and a lot of it was super stressful. He spent 3 months in rehab, needing us to be his coach, supporter and family. So I did it…and I ate my way through the stress, upset and worry. Have you ever been there before? I’m going to bet that many of you have. It was then that I realized that I was an emotional eater…some of the weight I’d lost came back and I didn’t feel so great anymore. I started to ask myself what kind of health coach could I be with this slip? Guess what…I’m the best kind of health coach! I’m human and vulnerable – just like many of you. I had a set-back and that’s a part of real-life. I had the chance to spend a lot of time with my Dad – and what a gift that is (by the way he’s fine now and 100 years old!). The biggest gift was that I learned a lot about myself and how to use my knowledge and power to dig even deeper and start living my life for me again. I believe we all have this power – we just need to uncover and own it. I know many of us live our lives for others…our kids, parents, spouse, work or maybe all of the above. I’ve learned that putting myself first is what fills me up and gives me the strength and joy to help others. 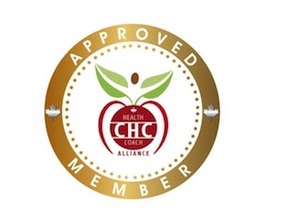 As a Registered Heath Coach, I am a master of habit change, a good-living cheerleader, mentor, and wellness authority who inspires, educates and empowers clients to reach their health goals through healthy lifestyle changes. Practicing holistic health with a focus on the emotions and triggers that lead to poor choices, is my way of sharing abundant energy, joy and gratitude. Instead of prescribing a diet, I tailor my 90-Day Coaching Program to you – each program is as unique as each person. Using mind-set, habit change, nutrition and practical living tools, I help clients achieve their health goals to live their best life. My passion has always been to inspire others. Now I want others to know what it feels like to believe in themselves, take their life back and have that accountability and support of someone they can relate to. I now have a life that radiates joy, gratitude, abundant energy, speaking my truth and knowing I am enough. What better gift than to be able to share this! When we fuel our mind, body and spirit, magic happens!